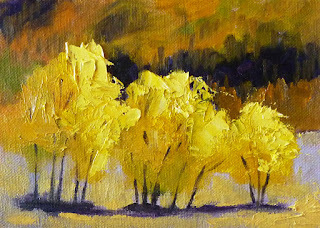 Another from the Dechutes River Trail series has come off the easel. If anyone is familiar with the red brush that grows along the river at this Central Oregon destination, I'd love to know. When everything has turned pretty desolate, these beautiful red shrubs poke their heads out and brighten the day. This 8x10 inch oil painting SOLD at my Etsy Shop, but prints are available at my gallery at Fine Art America. Click here to view available formats and sizes. Today's painting is one of a series I've been working on. Last April my husband and I spent a week in Bend,Oregon. It is a great time of year to visit because by the time we cross the mountains into the high desert of Central Oregon, we are water soaked, skin wrinkled, pale shells of our former selves. It is a delight to leave the drenching rains of Washington's coast and see a place where the sun comes out frequently and patches of snow still lay on the ground. 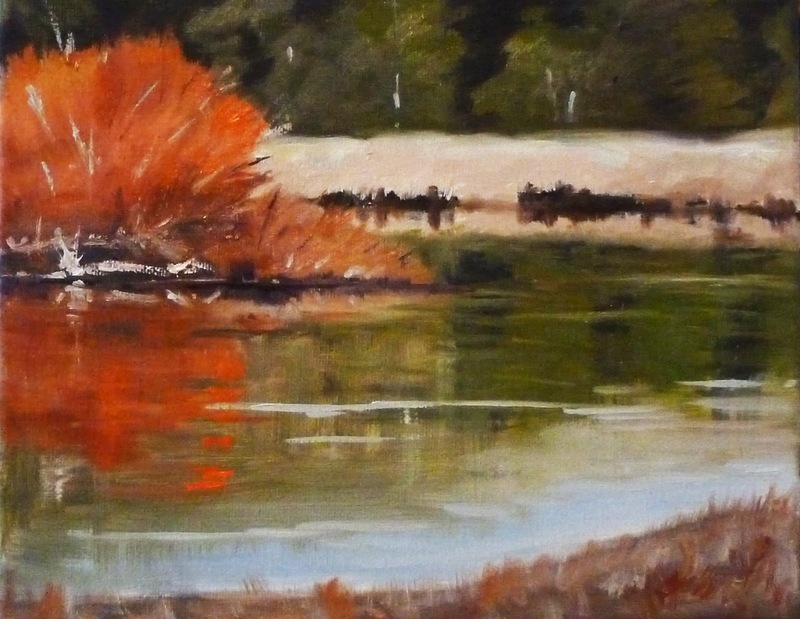 This 8x10 inch oil painting was inspired by a ten-mile hike up the River Trail in the Dechutes National Forest. It was still cold and winter like, but we were amazed that we could be outside for an extended period of time, see beautiful landscapes, and not get wet. 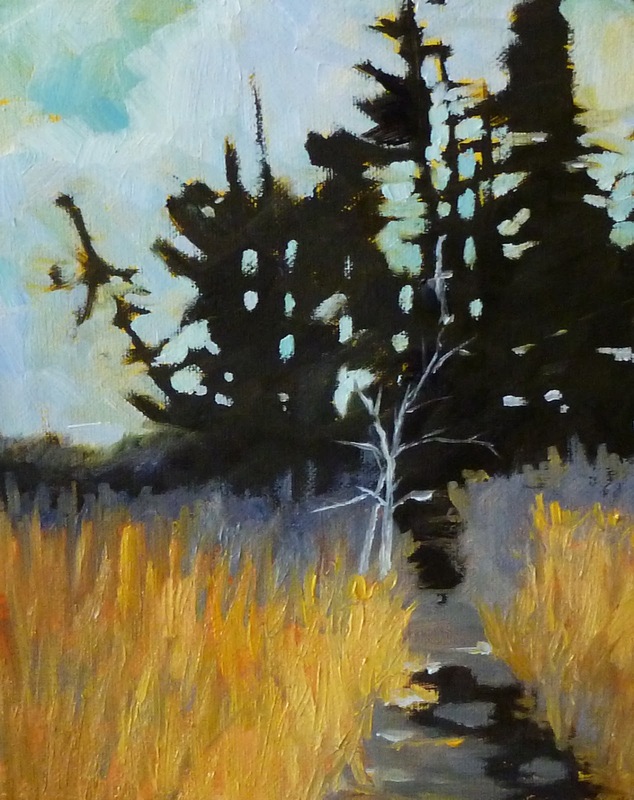 The painting SOLD at my Etsy Shop, but there are other original landscape paintings available at my Etsy Shop. If you would like to purchase a reproduction of this painting, visit this link to view prices and available sizes. It took me a while to finish this little 4x4 inch oil painting. In spite of its size, I couldn't decide on an effective color for the background. I repainted it at least three times before settling on this yellow-green background. Now the fluffy little guy is settled in a warm spot of sunshine. 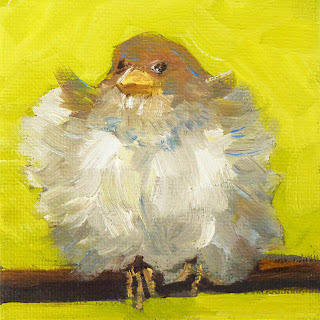 Today's painting is 6x6 inches on gallery-wrapped canvas. He is another addition to my series of animal portraits. It is so fun to create these little paintings. My son is my biggest fan. If it were up to him, I think he'd like me to just pass them all over to him. He has a goat, a gorilla, and I can't remember what all. Maybe for the holidays I'll have to create something just for him. 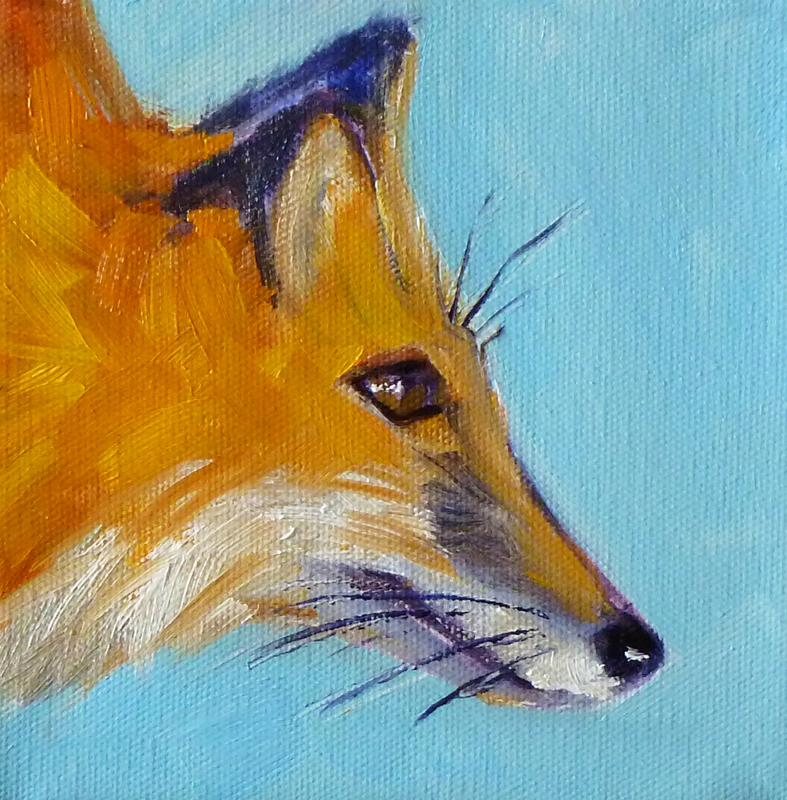 This fellow has SOLD, but there are some more animal paintings available at my Etsy shop . Original little animal portraits can be viewed here. If you are interested in a fine art print of this little painting, they are available here. Maybe other states have special Forest Service Roads; I'm not sure, but for some of us, these rustic roads in Washington Sate lead to wonderful places. They are great for traveling by jeep or motor cycle and sometimes lead to places where Christmas trees can be cut and hauled home. Usually they are out in the middle of nowhere and there is never a map, so one must travel with a sense of adventure and enjoy the sights, the wild life, and the delight of being far away from civilization. 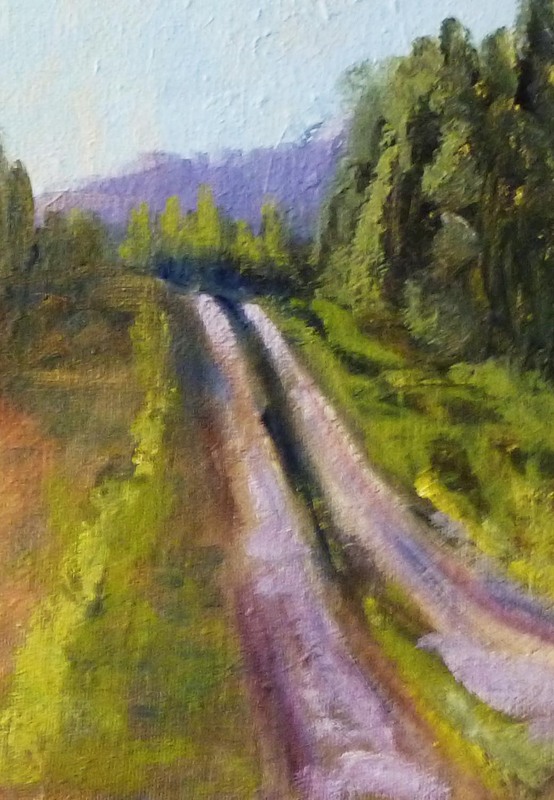 This little 5x7 inch oil painting documents the scene of one of those wonderful Forest Service Roads. The painting SOLD at the Daily Paintworks Auction, but you can see some of my other original landscape paintings by visiting my Etsy Shop. November rains are keeping me inside, but I'm imagining warm summer beaches. This little 4x4 inch oil painting takes me back to warmer days. He has sold to a new owner who probably also wants to escape to some warmer thoughts,so he's heading south. 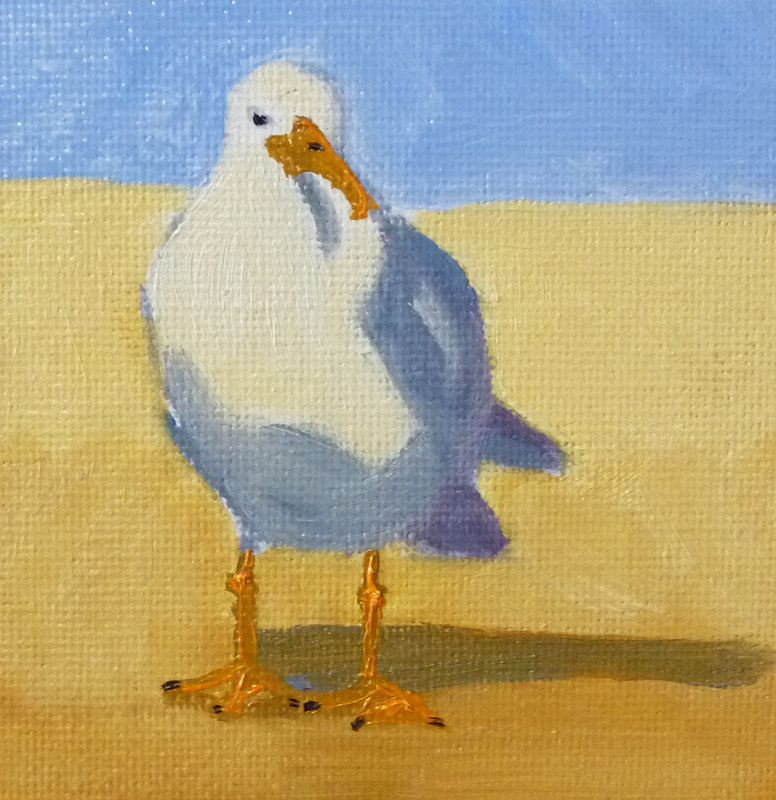 To view some of my other paintings of birds and animals, visit here, at my Etsy Shop. Today's 11x14 inch oil painting is a study in green, but to avoid a monochromatic result, I tossed a few red apples. 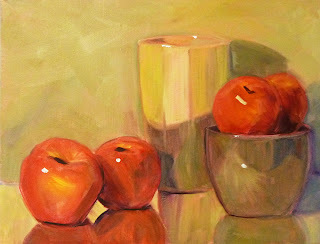 When the weather gets damp and ugly, I love to sit in my studio with the radio on and paint still life subjects. This one is for sale and can be purchased from either my Etsy Shop or my Daily Paintworks Gallery. This week I finally had to say good-bye to autumn and hello to winter. The rains have come to the Pacific Northwest. The weather is wet, dark, and endless. That's why today's little painting feels good. It is bright and reminds me of the crisp days of fall. It was fun to pile on thick paint and imagine something beyond rain. It is 5x7 inches and can be purchased from my Etsy Shop here.